The vacancies of computer assistants in various departments of the University of Kashmir were recently filled by candidates who are PhD, postgraduate degree holders and those who have qualified the National Eligibility Test (NET) in different subjects. Finally, the 300-bedded District Hospital, Baramulla, in north Kashmir is ready to be shifted to new location at Kanthbagh next month. The new building has been under construction for about two decades. Majority of industrial estates in South Kashmir along with individual industrial units have been affected in the wake of poor power supply rendering the manpower at these units idle. Reports said these estates are witness to power cuts like before. One person died while another was injured in road accidents in Kashmir valley. Police said a 45-year-old man died in a road accident in Srinagar on Thursday evening. Clashes erupted in a couple of places in Kashmir valley on Friday afternoon while the mid-day protest call given by a separatist outfit failed to get much response elsewhere in the region. Patients of Lolab valley in Kupwara district are facing problem due to non-availability of a radiologist at the Sub-District Hospital, Sogam. The ultra sonography (USG) machine at the hospital is gathering dust for past more than three years due to lack of a specialist doctor. The government today dismissed reports that the situation in the aftermath of the execution of Parliament attack convict Afzal Guru had led to large scale cancellation of tourist bookings in the Kashmir valley. The National Conference (NC) today issued a volley of allegations against the Peoples Democratic Party (PDP) and its leader Mufti Mohammad Sayeed for making the region “hostage” and committing “genocide of youth” during the early years of militancy here. 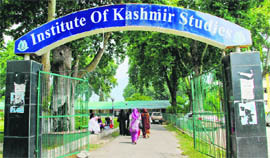 As many as 90 postgraduate students are presenting research papers on medicine, microbiology, surgery and allied subjects at the Sher-e-Kashmir Institute of Medical sciences (SKIMS), Soura, in a three-day 17th Post Graduate Research Presentation (PGRP), which started yesterday at the SKIMS auditorium. Emphasising that no state can prosper without the support of the people, the National Conference yesterday urged the people to support the initiatives taken by Chief Minister Omar Abdullah. As many as 51 employees of the Srinagar Postal Division received the excellence awards during a postmasters conference held here. Union Renewable Energy Minister Farooq Abdullah today extended his wishes to the Christian community on Easter celebrations. 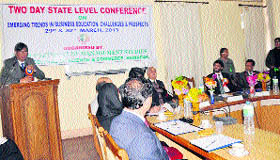 A two-day state level conference on "Emerging Trends in Business Education: Challenges and Prospects" began today at Islamia College of Science and Commerce (ICSC). It was inaugurated by Prof Talat Ahmad, Vice-Chancellor, University of Kashmir (KU). The 17 posts of computer assistant in Business School, Directorate of Quality Assurance, Academic Staff College, North Campus, Baramulla, and South Campus, Anantnag, had re-invited application for these posts last year. The eligibility criteria for the candidates to appear for these posts were a graduate degree with specialisation in computer or a diploma in computer application. An unprecedented 3,000 aspirants applied for the posts, majority of whom were overqualified for the advertised job profile. The written test for the posts was conducted earlier this year in January in which 96 candidates were selected for computer test. Thereafter, 51 candidates were called for interview round. The selection panel comprised senior faculty members including Tassavur Kanth, Zaman Ahmad and Shabir Ahmad headed by Dean Academics Prof AM Shah. The newly recruited candidates who joined on March 12 include four Phd degree holders and two of them have research publications to their credit whereas six candidates were earlier working with the Jammu and Kashmir Bank. Some of them are ex-employees at the Sher-e-Kashmir Institute of Medical Sciences, Soura, in Srinagar. Academicians term the trend of overqualified candidates applying for the jobs as highly negative. They urged the state government to revisit its education and employment policies so that higher qualifications such as doctorate, postgraduate are not rendered waste. “It is unfortunate that highly qualified candidates are not getting jobs according to their field of study and education. They are forced to settle for jobs which do not match their profile. As a matter of fact, there are not enough scope in public and private sector in the state where these people could be employed. It is a high time that the government must revisit its policies so that education does not suffer,” Prof Imtiyaz Ahmad, an academician at the University of Kashmir said. “The new hospital building is being inaugurated in April. The hospital is equipped with state-of-the-art machinery and equipments,” Dr Saleem-Ur-Rehman, Director, Health Kashmir, said. “We have planned many things for the new hospital. We hope it will help in improving the healthcare infrastructure in north Kashmir,” he said. The construction of the hospital building had started way back in 1995. The work was going on a snail’s pace due to which the hospital could not be shifted. The hospital administration had shifted the out-patient departments (OPDs) of ENT and dental departments to the under-construction building at Kanthbagh few years ago. But, even the surgeries of these two departments were conducted at the old hospital complex, about three kilometres away from the new hospital. The residents are hopeful that the government will provide sufficient manpower to run the new hospital. “Buildings don’t make good hospitals. The existing 100-bedded hospital in the main town is short of 90 staff members, including 30 doctors, as against the sanctioned strength. Shifting to the 300-bedded structure needs at least three times the existing staff for smooth patient care,” said a doctor at the Baramulla hospital. “Equipment does not mean furniture. Patient care can be improved by state-of-the-art surgical and medical equipments requisite trained staff,” he added. Another doctor said the government must keep in mind the fact that this hospital is a referral hospital for three districts in North Kashmir- Baramulla, Bandipore and Kupwara. “This hospital should work 24x7 in a real sense. To make this happen, it needs staff augmentation- both doctors and paramedics. It should be a mini-SMHS type hospital. The hospital should have half the staff of SMHS which is a 500-bedded hospital. It should have multi-specialty type causality manned by good number of postgraduate assistant surgeons in each major discipline,” he added. A senior health official said they would try to provide more manpower to the hospital. Unit holders say they are facing difficulties because of erratic power supply as a result of which their units are incurring huge losses thus forcing many to contemplate winding them down. Other unit holders say they have been requesting the authorities to provide them essential power lines but nobody is “paying heed to them”. “We have been running from pillar to post to get a dedicated power feeder for our industrial estate but to no avail. 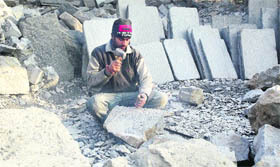 All we get is hollow promises from the authorities,” said Danish, a unit holder at Bijebhara industrial estate. People associated with industrial sector say power supply for six to seven hours a day will suffice them provided it remains uninterrupted. “If power supply remains uninterrupted, we can manage our work accordingly and it will help us improve our productivity,” said Mohsin, a unit holder in Anantnag district. Individual unit holders operating from places other than the estates are the worst hit. “I have been trying my best to get a line but the authorities do not even listen,” said one Tawseef Ahmad. 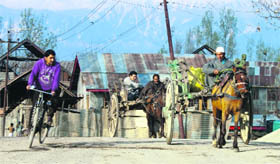 Unit holders say if the power scenario continues to be what it is these days, Kashmir will see a lot of many winding down their units in near future. “The apathy of the government agencies is ironic. On the one hand, they emphasise on self-employment schemes while on the other they are least bothered about people who take initiatives to be self-sufficient,” said an industrialist from Anantnag pleading anonymity. A bus hit and injured cyclist Abdul Rehman Ahanger of Babapora in Zoonimar at Ali Jan road of Srinagar, the police said. "The injured was shifted to SKIMS, Soura, for treatment where he succumbed to his injuries," the police said. A case has been registered in this regard. In another accident, a motorcycle driven by Umar Shafi Najar of Pethkal Lolpora in Kunzer hit and injured Farzi Begum,70, a resident of Takaya Batpora near Dobiwan, Baramulla today. The injured was shifted to the Sub-District Hospital, Magam, for treatment where her condition is stated to be stable. A case has been registered in this regard. In Srinagar old city, clashes broke out after Friday prayers between youths and police at Saraf Kadal locality that continued for several hours. As youths pelted stones at the police and paramilitary personnel, the latter retaliated by firing tear smoke shells to disperse them. The clash at Saraf Kadal erupted soon after the moderate separatist leader Mirwaiz Umar Farooq had led a march of several hundred supporters from Jamia Masjid to Rajouri Kadal. Demonstration was also held in north Kashmir’s Baramulla town where youths pelted stones at police and paramilitary personnel during noon. Separatist council Mutahidda Majlis-e-Mushawarat had called for demonstrations after Friday congregational prayers to demand the return of the body of Parliament attack convict Muhammad Afzal Guru. The council’s call, however, failed to evoke much response from most parts of the region. Reports said there were no major demonstrations anywhere in south Kashmir. There was also no large scale demonstration anywhere in central Kashmir’s Budgam and Ganderbal districts while the protests in Srinagar city remained confined to just one locality of the old city. In north Kashmir, there were no demonstrations anywhere except for at Baramulla town. The separatist council’s weekly protest calendar, which it issues to the press for the demand of return of Guru’s body, has evoked a lackluster response in recent week. Patients rued that they were forced to travel miles to conduct the USG test at the Sub-District Hospital, Kupwara, or private laboratories in the town. The USG machine was installed at the hospital in 2009 at a cost of Rs 4 lakh. “The machine has never been put to use since it was installed more than three years before. The hospital does not have a radiologist required for operating the machine,” hospital sources said. The hospital caters to a population of more than 3 lakh people from at least 40 villages of Lolab valley. Patients demanded that the machine be made operational at the earliest. “I waited for about an hour in a long queue at Kupwara hospital to get the USG test done. A doctor at Sogam hospital had advised the test,” said Shafiqa Begm of Darpora, 16 km from Kupwara. Other patients complained that they were denied the USG test by doctors at Kupwara hospital and therefore were forced to get it done at private laboratories. “I paid Rs 500 for doing the test at a private diagnostic centre in Kupwara. A doctor at Kupwara hospital told me that he would conduct tests advised by doctors at Kupwara hospital only,” said Abdul Ahad of Sogam in Lolab. The hospital receives nearly 200 patients in its out-patient department (OPD) everyday from across the Lolab valley. Local residents said their problems would get aggravated in emergency cases due to the non-functional machine. Kupwara Chief Medical Officer (CMO) Dr Muneer Ahmad Khawaja said a doctor would be deputed to operate the machine for one day in a week. “We have made an alternative arrangement to make the machine functional. For the time being, a doctor will conduct the tests at the hospital for one day in a week,” the CMO said. “I challenge anybody who says that 90 per cent bookings have been cancelled. Violence happens elsewhere too and it leads to disruption for sometime, however, things again move normally later,” Minister for Tourism Ghulam Ahmad Mir told reporters after inaugurating a function organised by the Tourism Department at the Zabarwan Park here. Asserting that tourism should be “de-linked” from politics, Mir said the sector was being “unnecessarily targeted” while urging people to give “tourism a chance”. 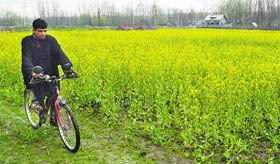 While the Tourism Department kick-started ‘Kashmir Spring Festival’ celebrations today, the Tourism Minister said the aim of organising the festival was to send a message that the Valley was ready to welcome tourists from all over. Later, the minister gave awards to 200 schoolchildren who participated in a ‘shikara’ race and painting competition on the occasion. He said the government would organise several events to popularise and explore the potential of tourism this year. Earlier, Mir also addressed a function in connection with Kashmir Spring Festival organised by the Islamic University of Science and Technology (IUST), Awantipora. Speaking on the occasion, he urged the student community to play their role towards flourishing tourism in the state. Mir also urged students to contribute by writing articles on tourism activities, while adding that peaceful atmosphere in the state was pivotal not only for tourism boom but also beneficial to convey a good message at global level. He said those students who contributed good articles would be awarded. “The person who made Kashmir hostage from 1990 to 1996 and committed serious crimes as murders, custodial killings, rapes, unknown graves and genocide of youth, that Mufti (Mohammad Sayeed) and his party is now playing dirty politics on pepper gas and curfew and bringing resolution to gather the sympathy of the people,” Mustafa Kamal, additional general secretary, NC, said in a statement. Kamal said the attempt of the PDP to bring resolutions against pepper gas and curfew was aimed at "misleading" people. He said boycott of the Assembly sessions by the PDP has “unmasked” it. “It is the PDP, which gave stones in the hands of youth and it was Mufti Sayeed, who gave permission to the youth to fire in 1990,” he said. Kamal, while defending the imposition of the curfew and use of pepper gas, said it was not a “habitual” act of the government. The students are being given eight minutes time slot to make the research presentation, which is followed by a two-minute-long discussion. The best three presentations will be rewarded at a valedictory function, which will be held tomorrow. their papers everywhere else in the country and even abroad. Prof Mehrajuddin, Former Director SKIMS, and member governing body, SKIMS, opened the event yesterday. Dr Showkat Zargar, director, SKIMS, congratulated the students and scholars for their work and appreciated their efforts and commitment towards the profession. “Underscoring the need of research as an important activity in medical field, the Department of Clinical Research has been established to promote research activities at a large scale,” he added. The director, SKIMS, thanked organising chairman Dr Khursheed Alam Wani and organising secretary Dr Fazal Parray and said the SKIMS would provide more resources and support for various scientific programmes. The Post Graduate Research Presentation is an annual academic activity of the Sher-e-Kashmir Institute of Medical sciences and was started in 1988. It was conceived by Prof Syed Zahoor Ahmad, former director, SKIMS, where all medical postgraduates and postdoctoral scholars, who have completed their dissertations / research thesis, present their work. “The state is limping back to normalcy and we are trying our best to ensure that people do not face any hardship,” political secretary to the Chief Minister Tanvir Sadiq said in a statement issued yesterday. “The Omar government is people friendly, result-oriented and has a vision to ensure peace, prosperity and progress of the state,” he said. He said Omar had reiterated that Kashmir issue was a political one and could only be resolved through political means. “Omar has told the Parliament that Kashmir issue cannot be put into a back-burner by announcing economic packages, but a result-oriented dialogue should be held to solve it. The same thing he has repeated on the floor of the House,” the political secretary to the Chief Minister said. “The Kashmir issue exists and no one can deny it. It is not necessary that we should agree with each other’s viewpoints, but at the end of the day, we all want to address this political issue and resolve it amicably,” Tanvir said. “There is a need for a sustained political initiative to evolve a consensus for resolving the problem through peaceful means. At this moment, a concerted and comprehensive effort is imperative to make the state not only economically but also politically strong,” the political secretary to the Chief Minister added. “To connect with the staff members and apprise them of the latest developments in the field of computerisation and modernisation of post offices in the J&K Postal Circle, a postmasters’ conference was held on Sunday last. The awards were also presented to 51 employees from the Srinagar Postal Division who had displayed excellence in their work,” the spokesperson of the Department of Posts, J&K Circle, said in a statement issued here today. He said John Samuel, Chief Postmaster General, J&K Circle, presented the awards. On the occasion, Samuel appreciated the efforts of the postmasters, who had played a major role in the transformation of the J&K Postal Circle. He said 20 post offices were being upgraded in a month with state-of-the-art technology and improved services. The post offices include those at Bandipora, Ganderbal, Qazigund, Chadoora, Kashmir University, Karan Nagar, Verinag, Brein and Lal Chowk areas. The conference was attended by around 500 postmasters. An interactive session of the postmasters with the Chief Postmaster General was also held on the occasion. Special lectures on “Motivation, Customer Relation and Team Effort” were presented by Mohammad Ayub Shah and Prof Mushtaq Ahmad Darzi from the University of Kashmir. Farooq, in a statement issued by his party National Conference, said the teachings of Jesus Christ are about love, human and equality. He also prayed for peace in the state. Easter greeting were also extended by National Conference general secretary Sheikh Nazir. Prof Talat said collaboration and partnership with the leaders of industry was a must for B-schools and they should organise more interactions of their students with the corporate world so as to provide an insight to the youth about the changing dynamics of the corporate world. He said under the UDAAN project, there was a policy to provide jobs to around 30,000 youth of the Valley in various MNCs across the country as the only thing which these young people needed now was to develop taste for mobility so as to travel to various parts of the world. Earlier, in his keynote address, Prof Shabir Ahmad, Director, Business School, KU, highlighted various challenges faced by business education, including emerging competition, developing leaders for the industry, cross cultural diversity and conflict and understanding global perspective. TA Kawoos, principal, ICSC, said institutions had a great responsibility and the sole objective of any system of education was to make students competent enough to face challenges of the modern world.